MARQUETTE — Northern Michigan University’s Center for Native American Studies is in the process of creating more space in their resource room, as they’ve ran into a bit of a spacing issue thanks to recent donations. 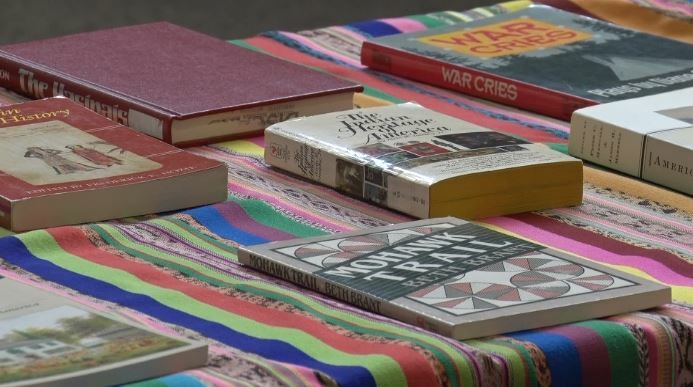 This afternoon in Whitman Hall, the center hosted a book giveaway featuring many titles on a number of subjects, as they relate to Native American Culture and Heritage. The director of the center, April Lindala, says it’s a great problem to have. Every book was free of charge, all from history, to law, and even works of fiction. “Connected students with tribal communities and issues is so important because we’re all neighbors, we all share this planet, all we all need to know who we all are as a way to get along,” said the Director of the Center for Native American Studies, April Lindala. An upcoming poster session event with the center will be held on December 4th to discuss Michigan and Wisconsin Tribal Relations.